This condominium has easy access on the main level to the entry of the condo and radiant heat on the lower level. The kitchen is open allowing for “several cooks” in the kitchen and a double oven, not thought of often, in a condo. The kitchen layout allows for a dining table that sits six (6), large granite countertop, gas cook-top, knotty alder cabinets and doors with attractive black appliances. 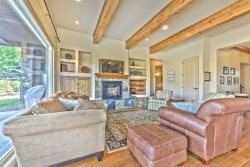 Furnishings are tasteful and cozy with a stone fireplace to warm on colder months. Main level has a deck with a view, while lower level as a walkout patio that’s convenient to the community hot tub and grills. The Moose Hollow Condominium development has much to offer with 168 condos in 14 Buildings. The Buildings have a distinctive style with large vaulted foyer, large windows and ski lockers. The onsite amenities include two (2) hot tubs, one (1) swimming pool, sauna, outdoor grills, sand volleyball court with outside gathering space. Moose Hollow has four (4) floorplans ranging from 1100-1575 SF sporting 2-3 bedrooms. Newer Buildings have radiant heat in the below grade levels. The neighborhood is located at the entry of Wolf Creek Resort and has daily UTA transfers to Powder Mountain in Winter months. Had a great trip. The condo was perfect for our group. We have stayed at several different properties and have enjoyed them. The team members worked hard each time to meet our particular needs as to the rooms that would work the best for us and also meet our financial needs. We were pleased with the rooms and the price we paid. I felt they did their best to listen and find rooms that our family would be happy with. We got 2 rooms for a family reunion with our Children and Grandchildren. They were very happy with the location and the rooms. One of the things everyone talked about was how much fun they had playing games, visiting and enjoying watching all the grandchildren playing together. In the end instead of using any electronics or really even watching much TV, there was a lot of interaction with everyone like we had hoped for. It was not warm enough to swim at the time we were there, but they enjoyed the game room, taking walks in the day and evening, looking at the stars at night, and playing together outside. Everyone was sad to see the weekend end as they were enjoying it so much. They all agreed they would love to come back again. Made some great memories! All reservations are billed a one-time processing fee of $30. Departure clean is $200. Cancellation Policy: Any reservation cancelled 30 days or more prior to arrival will have their deposits refunded minus the $30 processing fee and any credit card fees. Reservations cancelled within 30 days of arrival will forfeit their deposit.